Last week I finished The Hunger Games. Before I get too far into this review, let me just say that I think there are two types of stories, whether in movies or books – stories that have some sort of driving point (whether inspirational, educational, political, etc. ), and then there are stories that are mainly for entertainment, with no clear point. And I think that’s just fine. I can really appreciate both types. When I decided to go ahead and read The Hunger Games, I was under the impression that it was of the first variety – a story with a point behind it. I heard from multiple sources, people and articles, that The Hunger Games was meant as a “cautionary tale” of what could happen when government or the media get out of control, or of what may happen if we lose our sensitivity to violence as a society. And I just have to say, having read the book now, I didn’t get any of that. I see no real point against letting government or media get out of control in the book. Sure, the government and media are out of control in Panem, but I think they have to be to make the plot work. Though I obviously don’t know exactly what the author was trying to portray, as I was reading I didn’t get the feeling the author wrote this book trying to make a point about either media or governmental control. They just seemed like necessary plot elements. As for the idea that she’s trying to send a message about not losing our sensitivity to violence, if that is so then I think the content of the book is rather counter-productive. Deaths are described in detail, and it’s one of the more violent books I’ve read. Generally speaking, the more violence we are exposed to in books and movies the more danger we are in of becoming insensitive to it, so I can’t say I think this book is all that helpful on that point. If a book is going to have a message behind it, there has to be some dialogue or scenes in the book that really drive the point home – and I kept waiting for it, but it never came. There were vague stirrings of a point here and there, and I kept thinking that maybe this is where “cautionary” message I expected to read would be addressed, but nothing that I would consider solid was ever said. If there was a point that the author was trying to make, it was weakly portrayed. Strictly judging from content, I wouldn’t see any particular intended message behind this book without also reading a commentary on it. All of those suggested points I mentioned before came from commentators, not from the actual book itself. I have no problem if commentators or parents want to use the story to help make their own point about out-of-control government or media, or about being insensitive to violence. But the book itself is pretty neutral and doesn’t exactly say anything against either – the reader is left to draw their own conclusions, if any are to be drawn. So if this isn’t a book with a particular point (and I just don’t think it is, in and of itself), then it’s main value would lie in entertainment. Which is absolutely fine. I’m not one of those people who thinks everything has to have a purpose, and I love a good, entertaining story. If I’m looking at the book from a strict “entertainment-value” standpoint, then I do have to say that the book is very entertaining. It’s exciting and suspenseful. Every time I finished a chapter I had a hard time not starting the next one. There’s no doubt that it’s well-written. However, I kept feeling like there was something that was just off. And I wish I could put my finger on it better. Maybe it was the fact that I thought Katniss was almost disturbingly good at playing “the game”, and everything she did seemed to be for the camera - we are left to applaud her for her cleverness throughout the story, even though doing things only for the camera shouldn't necessarily be something to aspire to (I don’t think so, anyway). Maybe it was the plain old reason that this entertaining story was, in fact, about children being forced to kill other children. Maybe it was because I felt that even though the violence in the book wasn’t condoned, it almost seemed to be accepted because that’s “the way things are” in Panem. Whatever it was, something just didn’t sit right. I agree with the mom who petitioned to get The Hunger Games off her middle schooler’s reading list from her school - I don’t think this book is appropriate for younger preteens/teens. Kids that age are so impressionable, and they are still forming their worldviews. I don’t think it would be beneficial for a child that age to be reading about a world where kids do whatever it takes to survive. In my opinion, it would be wise to wait until they were a little older and had a bit more practice at thinking critically about this sort of thing before reading this book, if it is indeed a book the parent decides is okay. I’m not trying to pick on the book or be overly-critical, and I can’t say I thought the book was “bad” . . . but I also can’t say I thought the book was good. It just was . . . and for a book that just is, I have my doubts. Though it was hard to put down, and I was dying to find out what happened between Katniss and Peeta, I can’t say I’m really a fan for that reason. Thankfully there are lots of reviews with spoilers out there, so I know what happens with Peeta and Katniss without having to read the next books. Okay, I’m prepared to be pelted with rotten tomatoes now, but that’s my opinion. Take it or leave it. We aren’t going on a vacation this year. With Derek’s new job, he doesn’t start accruing vacation time until this fall. So I’ve been hoping to plan a few short trips here and there this summer over the weekends instead, and this past weekend we went on our first trip to visit my grandmother! My grandma and new grandpa (my grandma got married again last year) live in this beautiful mountain town a few hours away from us, so we planned to drive out there and visit over Memorial Day weekend. I’ve been wanting to visit her there, so I’m so glad we had a chance to go! The three of us on our walk. My grandma and new grandpa – aren’t they cute together? It was windy, so Wyatt wasn’t overly happy, but otherwise it was a good picture. Wyatt loved their dog, but I think he was looking at the birds outside the window here. Gramie, Wyatt, and me (it was obviously time for Wyatt’s nap). One last shot on their porch before we left on Monday. We had a wonderful time visiting with them, and I think we’re going to have to plan a trip again soon! I’m hoping we can go in the fall sometime, because I think it would be gorgeous up there in the fall. And hopefully this is just the first recap of a few little trips we’ll get to go on this summer. I really want to make the most of it, and there are a lot of fun things to do around here too, so we have options! It should be a fun summer! So, I finally broke down and rented The Hunger Games from the library. Most of the time I know I won’t like these fad-type books so I don’t even bother reading them. But this one sounded like it might be alright, so I thought I’d give it a go, if for no other purpose than for cultural research. I only just started it, and I'm a little skeptical, so don’t ask me what I think of it yet – if I have anything significant to say on it after I’m done, I’m sure it will be mentioned in another post. This girl’s story has been weighing on me this week. Secondary infertility is just as hard as primary infertility, just in a different way, and I’m not sure everyone understands that. Go give her a little encouragement, if you are so inclined. Also pray for this girl, who just found out she lost her baby after trying to get pregnant for six years. My heart hurts for her and I’ve been thinking about her a lot this week too. What makeup products do you wear regularly (select all that apply)? So mascara and cover up/foundation come in as the most popular products! Not too surprising. Blush/bronzer and eyeshadow are the next most popular, and lipstick is at the bottom of the list with 5 votes. But guys. Seriously. You need to wear sunscreen. I admit I’m not perfect at remembering to wear it daily, but if I know I’m going to be in the sun? You bet I wear it. If there is anything my mom taught me about daily beauty regimes, it’s to wear sunscreen! And when I’m eighty my skin will still look porcelain-like. So yeah, go buy some ASAP. Next poll is about how long you’ve been blogging, so be sure to vote to the left! It was quite an experience, I’ll say that much. Most of our time was spent sitting in dental classes, but I won’t bore you with the details of all that. You want to hear about what we did for fun, right? Well, first off – when we arrived in Vegas our boss surprised us with a ride to our hotel in a limo! I have never ridden in a limo before, so it was very exciting. The first evening (after classes) we just hung around the resort, and it was lovely. I could have spent the entire trip there. For one thing the pool area was amazing. There were so many little pools surrounding the big pool, with lots of lounges and even those canopied beds that you see in commercials for the Caribbean. You know, just in case you want to take a nap in the sun. I wish we were able to spend more time by the pool! After dinner we also went bowling – at the bowling alley that was also in our hotel. I liked how everything was just right there – we honestly didn’t even have to leave if we didn’t want to. There were all kinds of shops and restaurants and things to do just at the resort. Obviously it wasn’t our highest-scoring game ever. Note my sister’s sad face, and my pretend angry/annoyed face? I love bowling though. I’m just out of practice. The second night our whole office decided to go to the strip and walk around. I could have just spent some time by the pool again, but it was a whole-office thing, so off we went. It was . . . interesting. There were some cool displays and the lights were neat. But other than that, I wasn’t impressed. It just seemed kind of sad to me. A bunch of people walking around, many of them starting to get drunk. Women in dresses that were way too tight. Billboards for strip clubs. Vendors standing on the sidewalks, slapping stacks of flyers for prostitutes, trying to get you to take one. All these people trying to make themselves happy, but not really succeeding, because the only thing that can give them true joy can scarcely be seen there. It was just sad. We did see a brave group standing on the sidewalk holding signs that said “In God We Trust” and “Jesus Is The Way”, or similar sayings, and there were even a few people talking to one of them. That was the only glimmer of Light I saw in the entire place. I was happy to get back on the shuttle that took us back to the resort at 9:45 PM – we didn’t want to stay out any later than that. By this point I was so tired. By the time we got back to the hotel I was exhausted, and fell into bed as soon as I could. The final night our whole office went out to dinner and to see a show together, courtesy of my boss (she really is the best boss I’ve ever had)! The strip wasn’t so bad when we had a specific place to go and were just focused on getting there. We went out to dinner first at a place called Julian Serrano – the idea was to each order a dish, and then share it amongst everyone, so it was a unique dining experience! And the molten chocolate cake was so good. We saw Cirque Du Soleil, which is basically a bunch of acrobatics and such all wound into this show. I guess this year’s program was based on water, so there was a pool in the middle of the stage that kept disappearing and reappearing, and a ton of immense stage props that moved in and out, and live music. It was pretty amazing to see all the stunts, and the coordination it took to pull off a huge show like that was impressive. The show itself was a lot darker than I expected it to be (as in spiritually dark and rather weird), and I felt like some of the jokes the clowns made were not appropriate. The whole feel of the performance reminded me of Alice In Wonderland or Fantasia in that it was just a bunch of random weird things put together in this show. After a while I decided to ignore the dark aspects and just focus on the acrobatics, which were amazing! Overlooking the weird things, I thought watching the acrobats and contortionists do their stunts was very enjoyable. My boss splurged on another limo to and from the show, which was so exciting! It definitely made me feel like a VIP. Overall, it was a good trip, but it was different than I was expecting, mainly just because it was so exhausting! There was just a lot more on the agenda than I thought there would be. I came home and slept in until 10:45 AM, which hasn’t happened since I was probably 16. I decided I really don’t like Vegas (not surprising, I already knew I wasn’t a Vegas-type person), and I was terribly homesick for my home and my two guys. But we did so many fun things and learned a lot, so overall I think it went well, and I’m grateful to my boss for the opportunity to go! I intended to have a blog post about Vegas up by now, but after being gone last week this little guy won't let me leave his side. And I pretty much don't want to leave his either - I missed being home with him! Plus he's teething. He usually has a pretty easy time of it, but this time he's getting his molars. I know I haven’t been keeping up on blog reading very well lately. And that’s seriously because we’ve had a crazy couple of weeks. I know everyone says “things have been crazy”, but it really has been crazy around here. As in, I’m exhausted, and I’m really looking forward to June when things finally slow down. I’ll also hopefully have more than a couple minutes at a time to read blogs when that magical month rolls around. But until then I’ll probably just be getting more exhausted because. . .
Well, I’m not actually here this week. You probably didn't even know that. That's the beauty of scheduled posts, no? My boss flew our entire office to Las Vegas for a dental continuing education course! I happen to love these dental conferences/courses, so I’m pretty excited. As you read this I’m probably sitting in a classroom learning about different dental philosophies of treatment. Though I'm probably also missing Derek and Wyatt like crazy. If you haven’t figured it out by just reading my blog for a while, I’m not much a Vegas-type person. I don’t drink, I don’t do clubs, I think gambling is a waste of money. Thankfully since my sister works in the same office, we’ll be there together! So we have plans to go bowling and go to the movies in the evenings, because . . . it’s all right there in our hotel! I’m so glad she’s going to be there. It will be good sister-bonding time, and I’m thinking this could be fun. Form the pictures of the hotel it also looks like there is a really nice pool area, so that’s on the agenda if we have time. Our whole office is going to go to a show together one night, and I think we’re going to see Circus Du Soleil, which sounds pretty cool. Click on the link to check it out. Anyway, I hope you’ll excuse my non-commenting a little while longer, and I’ll let you know how it goes when I'm back next week! A lot of you may not know this, because I don’t think I’ve ever mentioned it on here before, but Derek is actually several years older than me. When we first met and he found out how old I was he almost thought it wouldn’t work, but then his pastor ended up preaching on Ruth and Boaz in church the next Sunday, and he was really emphasizing the age difference between Ruth and Boaz. Derek took that as his sign from the Lord that it was okay to date me. Derek was officially a bachelor before he met me. He was done with college, had a good job, had the bachelor “pad” and his meals consisted mostly of chicken and steamed vegetables. And the occasional enchiladas. Sometimes now, I’ll tease him about his bachelor days and how much I improved his life. Sometimes he’ll mention how he used to be able to spend money on whatever he wanted before he met me, and then once he started dating me all his money went toward taking me out (I really wasn’t high maintenance, he just knew how to treat a girl). The other day we were driving home, and a song came on the radio. Derek stated he liked the song and we turned the radio up, and as I listened I had to laugh. In the past Derek has said similar things to what the lyrics say, and now it’s officially one of my new favorite songs. If you haven’t heard it, you must listen. It’s a good one. If you'd never met me"
Well I'd be looking for a woman like you." If I'd never met a woman like you." I love that. And I love it because I feel like it could be describing Derek and me, because we both know we’re better with each other then we’d be apart. He’s changed my life just as much as I’ve changed his, and for the better. I may tease him about how much he needs me, and he may pretend to complain about how he had to sell his motorcycle because of me, but we both know we need each other. I know neither of us would “trade a single day”, and I’m so glad the Lord brought me a man like Derek! You know I’m better with you, Babe. I don’t know what I’d do without you. I love you! This week I’m featuring Jen from Our Love And Our Blessing! 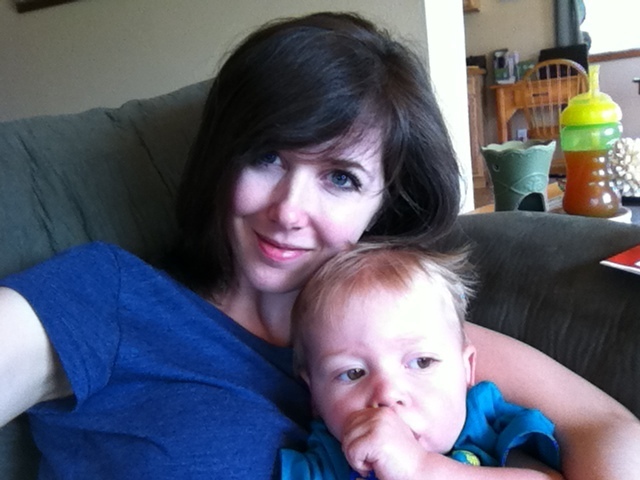 I found Jen’s blog last year and she writes about all kinds of stuff - I really enjoy reading about her boy, since he’s a few months older than Wyatt it gives me a glimpse of what the future holds! She has such a cute family, read on to learn more! Howdy! I'm Jennifer! 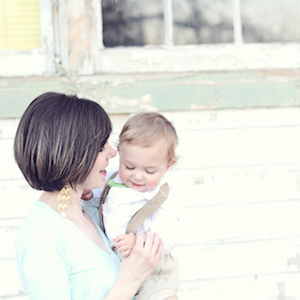 I'm a Texan that loves Jesus, all things DIY, my husband and, of course, our baby boy Boston. I'm a stay-at-home mom and I'm truly having the time of my life. After 10 years of dating, I married my husband almost 6 years ago. He's not only an amazing husband but he's now an amazing father that impresses me more and more everyday. God has been way too kind to me. What's your baby's name and how old is he? We have one son, Boston James, aka my sidekick. We are together 24/7 and I love it that way. :) He's a lively 19 month old! Once Boston finishes breakfast, we have a little bit of learning time on the floor. He loves for me to pull out his number, color and alphabet flash cards. So we lay them out on the floor and practice them. Around 9, he goes down for another nap until about 11. This is the time I get to eat my breakfast (standing up at the counter, which is something that happens often now that I'm a mom), tidy up, and do a little blog writing/commenting. When he wakes up, we either head out to our weekly mom's group at church, run errands, have a play date, head outside to play in our back yard or at our neighborhood park and have lunch all before his next nap at 2pm. He sleeps from 2-4p. This allows me to do some crafts and/or blog stalk. When he wakes up we go for a 45-50 minute walk in time to get home and start dinner for when daddy gets home. Thankfully, we now have a pretty structured day. It hasn't always been like this. I've never made him stick to a schedule, so it's nice to have that now. When daddy gets home around 6p, we eat dinner and then have playtime (typically on the living room floor) as a family. We head upstairs at 7 for bath and bible study (really....daddy reading the bible to B). By 7:30, we are tucking Boston in and saying his prayers. If you had to choose three words to describe your baby's personality, what would they be? 3 words to describe Boston are: cavalier, playful and loving. 2) He's definitely taught us to be less selfish. Being together for so long, kid-less, we could go and do anything whenever. Not anymore. It's all about him and we love it! 3) Getting to share something so special with my husband. Something that is a part of both of us! Do you have any tips on losing the baby weight, or any beauty tips for new moms? What have you and your husband done since your baby's arrival to keep your relationship strong? Along with planned date nights about every other month, we often make our weekend evenings special after Boston goes to bed. We either.... watch some recorded shows, rent a movie, build a fire and/or have a dessert. Even though we are not "engaging" in each other, it's still a fun night on the couch with the hub-ster. It's now become a tradition and something that we look forward to. 3) a swing! Boston would sleep great in it while I got some things done around the house. My favorite moments are family time playing on the floor. Being at home with our baby as a family is my kinda good time! Although we recently celebrated Boston's 18 month birthday at the zoo and had a blast! Thanks Jen! To read more check out Jen’s blog! Then we took a walk around the lake. After that we got some frozen yogurt and then came home. Then Wyatt and I just snuggled on the couch (he was totally in a snuggling mood, which I loved), and I read some of my book and we watched a movie. Wyatt gave me flowers and a card (via Derek). Wyatt actually did draw me a “picture” with crayons inside my card, and I love it! It was a wonderful and relaxing Mother’s Day for me. My sweet Wyatt is 15 months old! I can’t believe how fast the time goes. It feels like he just turned a year old yesterday. According to the doctor Wyatt is still in the 20% for weight, 50% for height, and 80% for head circumference. He’s gotten a few more teeth (he has four on top now and two on the bottom), and I think he’s working on his molars now. In addition to waving, clapping, and high-fives (which he has been doing for a while), he started raising his arms up when he wants to be picked up, and he’ll shake his head “yes” and “no” now. He also plays “Indian” with me (American Indian, not Indian Indian) – I was just being silly one day and gave an Indian cry, you know where you pat your hand against your mouth while making a noise? Wyatt copied me and started doing it, so now that’s a game we play. He always laughs at me when I make that Indian cry and then he does it back! Even though he’s been “dancing” for a while, it’s his new favorite thing now – whenever a song comes on that he likes (usually just songs with a distinct melody) he’ll start bobbing his head or swaying to the music. He has pretty good rhythm too! Last week I felt like he was also almost trying to sing along to a song that his walker was playing – I was humming to the song and he started making noises in time with the music, and he stopped when the music stopped! He definitely loves music. His words now include “dog”, “Mama”, “Dada”, “bottle”, (all of which he’s been saying for a while, but “bottle” has gotten a lot more distinct), and his new ones are “hi”, “bye bye”, and "more" (which sounds like a mix between "ba" and "mo" - it's hard to explain). He’s a very thoughtful baby and won’t say all his words to just anyone – I think he gets shy in front of people he doesn’t know as well. He’s been copying a lot of other words that Derek and I say, but those are the ones he uses intentionally to communicate. He’s been jabbering a lot more lately, and he always has such a serious look on his face when he’s talking – I wish I knew what he’s trying to say! He also says “boo”. The other night he just randomly grabbed his blanket and start playing “peek-a-boo” with me. He’s pretty tricky at it too – he waits longer sometimes to try to surprise me! I was saying “peek-a-boo” when he uncovered his face, and then he started saying “boo”! He has connected some of the words he knows too – I asked my sister to watch him one day, and met her at the grocery store to pick him up, and she said when Wyatt saw me through the car window he said “Hi Mama”! I so wish I could have heard him say it! He melts me heart. He’s still pulling himself up on everything and “cruising” around furniture, and has balanced by himself for a few seconds, but he’s pretty cautious and likes to be holding on to something. He will take a few steps just holding onto one of my hands. I think he’ll be walking in the next few months. He seems to have decided that crawling on all fours is, in fact, better than army crawling, so he’s dropped his army crawl and just crawls everywhere on his hands and knees now. I wish I had taken a video of his army crawl, because now it’s too late! The switch was pretty sudden. He’s known how to crawl on all fours for a long time, but he’s always preferred army crawling until the last month or so. He also jumps up and down in his crib while holding on to the railing, and it cracks me up. He’s really fascinated with other kids, and if he sees a kid he’ll just stare at them and jabber away. We were in the grocery store one day and this little girl was walking parallel to our cart trying to pass us, and Wyatt was just staring and smiling at her and talking up a storm, and she didn’t even look at him! It made me so sad. Most kids pay a lot of attention to him though and he loves it. He eats pretty much anything we eat, but he’s gotten a lot more picky in the past couple of months. I can’t get him to eat vegetables or any fruits other than bananas, unless they’re pureed. He loves everything else we give him though, and he seems to prefer food that has a bit of spice to it. If it’s too bland he doesn’t like it. We are officially switched over to the sippy cup full-time. It was much easier to make the switch after he learned to drink through a straw – I bought sippy cups with straw tops, and he does really well with them. Most spout cups we’ve tried have way too strong of a valve, but without the valve they make a mess, and he only puts up with it so long before he gets tired of it and stops drinking. So the straw cups have worked much better. He thinks it’s hilarious to feed me his food, and he laughs and laughs when I take a bite of something he offers me. I also give him a drinks out of my glass frequently, and sometimes he’ll grab the glass, and after he takes a drink he’ll push the glass toward my mouth and try to give me a drink – then he’ll crack up again when I actually do take a sip! He’s so funny. Sleep has been okay, he seems to be waking up in the night on and off more lately, and I suspect it’s because of his molars working their way in. I’ve given him a little baby Orajel before bed and it seems to help. Mostly he’ll sleep 10-14 hours at night though, depending on how tiring our day was. Wyatt is such a happy little guy, and he’s also a huge ham. He loves to have the attention on himself, and if something he does makes someone laugh he’ll try to make them laugh again. He laughs really easily at all my antics, and I love it! He has such a sweet sense of humor, and I can’t wait to see how it develops. I can’t believe how fast you are growing! You seem less and less like a baby every day, but I love seeing how you are learning so many new things. I love your sweet smile – I love how we have our inside jokes and how you laugh at them no matter how many times we’ve done it before. I love how you crawl so furiously to get to me quickly, how you pull yourself up by grabbing my jeans and how you bury your face in my legs, how you throw your arms out toward me when you want me to pick you up. I love it when I’m holding you and you look at whoever I’m talking to and pat my chest while saying “Mama, mama, mama” – as if to tell everyone that I’m your mama and you’re my baby. I love being your mama. I love having you as my baby. What a treasure you are, Wyatt, and I pray you never lose your happy spirit as you grow. You are a joy to everyone you meet, and especially to your daddy and me. We love you! Laura – DO NOT READ THIS! I’m posting about the gift I’m giving to Jack and I don’t want you to see this before I have a chance to give it to you! Anyone else who is not Laura . . . read on. Last week my friend Laura had her baby - a boy! One of the projects I have been working on lately was a “happy birthday” gift for her baby – and I knew I wanted to make a tag toy, because that’s what I have made for friend’s babies in the past. However, I wanted to try something different, instead of doing a regular square tag toy, and I saw an idea on Pinterest for a turtle-shaped tag toy, originally from this Etsy shop (in case you want to buy one). I thought it was so cute, so I thought I’d try to make my own! I love the way it turned out! It wasn’t too hard to make, and I think it’s pretty cute! I’m giving it with a lullaby CD (have you seen these lullaby renditions CD’s? We have the Third Day one for Wyatt and he loves it), and a cute little romper. I can’t wait to meet the little guy! It’ll be fun to snuggle a little newborn again for a few minutes . . .
P.S. Check out my poll in the sidebar if you haven't already . . .
Before The Second . . .